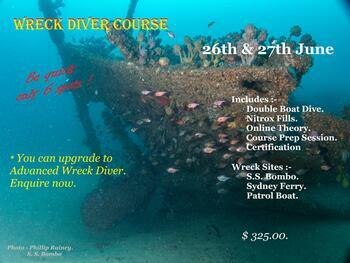 The Best Price with the Best Professional Instructors in the Illawarra $399.00 ! BECOME AN OPEN WATER SCUBA DIVER TODAY ! This globally-recognized Open Water Diver certification program is the best way to begin your life-long adventure as a certified scuba diver. Personalized training is combined with in-water practice sessions to ensure you have the skills and experience required to become truly comfortable underwater. Located in Windang, we are only 5 minutes from Bass Point, one of the best dive locations in N.S.W. We teach Recreational, Technical and Professional scuba diving courses including Learn to Dive Programs, Advanced courses, Speciality Diver courses, Divemaster and Instructor programs. Windang Dive & Spearfishing, provides for all your needs from, Scuba diving, Spear Fishing, Freediving and Snorkelling in one central location. Meet at the shop 8.30am for a casual mid morning dive. Please book in by 12pm Friday. This program provides you with the training and knowledge required to safely freedive with a buddy in water environments to a depth of five meters. Fun course includes Pool & Ocean Dives. This program provides you with the training and knowledge required to safely freedive with a buddy in open water environments to depths of 20 meters. Duration 2 Days, $ 449.00.